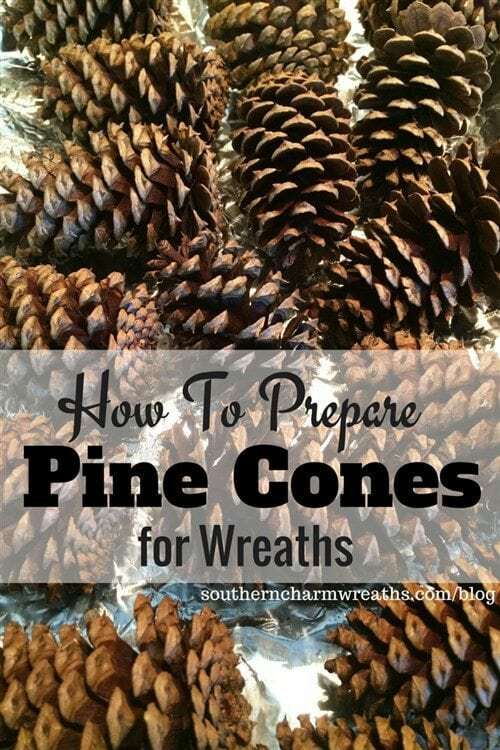 An easy way to prepare pine cones for wreaths! I love adding a bit of nature into my fall, winter and Christmas wreaths by using pine cones. However, I also like to keep the cost of my supplies down so spending money on pine cones, which are abundant here in South Carolina, seems crazy. I have a few pine cones in my backyard and when walking the dogs, I take a bag with me to pick up cones from other peoples’ yards, which they NEVER seem to mind–free yard cleanup! Before using fresh pine cones, I take the time to prepare them because there can be sap and critters inside them… Um yea, don’t think my customers want live critters in their wreaths. This post contains some affiliate links for your convenience. Click here to read my full disclosure policy. I found these beautiful pine cones when dropping off my daughter at Ebenezer Lutheran Church Disciple Camp at Camp Kinard here in South Carolina. They have a ton of pine cones ranging in different sizes and shapes. Jackpot!! Check out these these larger cones the hubs found. They will be perfect hanging on my living room Christmas tree, after I glitter them up of course! Remove any debris, like pine needles and sticks. Shake off any excess sand and dirt. Then wash the pine cones in a sink full of water with half a cup to a cup of white vinegar. Just swish the pine cones around to wash off any remaining sand or dirt. Drain the pine cones on a paper towel for a few minute so that the excess water will drain off. Spread the pine cones in a single layer on a foil lined baking sheet and place in a 200 degree temperature oven for 1-2 hours. Drying this way can take an hour or two depending on the size so check on them every 30 minutes or so, because they can burn. I read that if you try to rush the drying time, they become more brittle. Baking the pine cones also helps to remove any sap they may have. During the baking time, the pine cones will close somewhat but then open back up. Once the pine cones are completely opened, they are done. Below is an example of how the cones were closed and then starting to open after one of my 30 minute checks. Let them cool for 20 minutes before handling them. Now that the pine cones are baked and cooled, I prepare them to be wired into my wreaths. To do this, use gardening gloves, because these things are prickly and use an awl to punch a hole into the stem of the cone. Screw a screw eye into the bottom of the pine cone. Some of the petals will fall off and that is okay. Then place a dollop of hot glue around the screw eye to ensure that it stays put. Be careful not to cover up the hole of the screw eye. 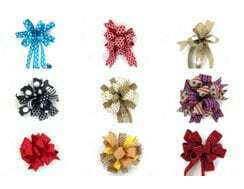 Now they are ready to be attached to your craft, wreath creation or Christmas tree using floral wire or a pipe cleaner. You can also spray them with a clear non yellowing sealer to give them a shine. I recommend Krylon Crystal Clear Acrylic Coating/Sealer or use them as they are. Since it is such a long process, I do a bunch at a time and store them in a cool dry place. I sometimes get so many, it takes me two years before I have to harvest more. Here is a wreath using three of the pine cones pictured above. Do you have any tips for using pine cones? If so, leave me a comment below. Thanks for all of your wonderful tips Julie. I enjoy your videos as well. God has blessed you with a wonderful talent and thank you for sharing all of your knowledge of crafts with us!!! Hey Julie I have a question. I gathered some pine cones and followed your instructions after 3 hours they still weren’t opened fully. Just at the tops and some not even that. They were smaller, I was wondering if that was why, or maybe they were very wet? Thanks for your help! Were they opened when you plucked them from the ground? If they were, it’s probably because they are still wet and need to dry out longer. Line a basket with tin foil(shiny side up).Then put in battery operated Christmas lights.Then add Pine cones (you can leave some plain and some sprayed gold or silver). Then add potpourri. The lights will heat the potpourri and you will smell it. Very nice beside a fireplace. Thanks for this very informative but well explained article. I have always been intimidated at just the thought of trying to make a pine cone wreath, as I have always loved collecting nice pine cones. Because of you, I am now excited at the thought of making one before the holidays this year. Thank you so much for your help. You are a blessing to me. Oh, Judy thank you for your kind comment!! Blessings sweetie. great tip, Julie! Never thought about baking them AND the eyehook!! Thank you for your comment Vicki. I like to use pipe cleaners or floral wire through the eye hook and then wire onto the wreath. Could you please show how to do this? 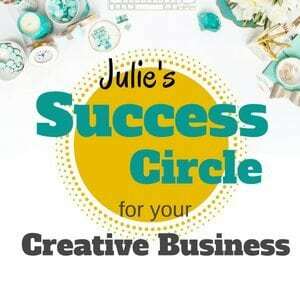 I just want to say Thank You Julie for starting the Strongest Facebook Group EVER with that ebook purchase!! I feel most of us have formed the best bonds and Friends ever. You allowed this Julie. 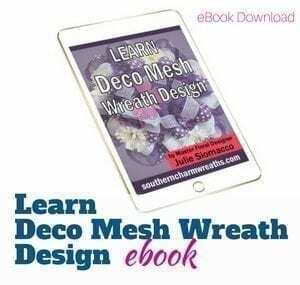 It’s so awesome the way EVERYBODY shares the way they make their wreaths the method they use and the way we help each other find Tutorials to help us. IF WE CANT FIND ONE YOU HAVE DONE FIRST !! Julie you have made it like HOME. I CAN NOT THANK YOU ENOUGH!!! GOD BLESS ? Awe thank you Connie!! This made my day girl! I enjoyed the ideas with the pine cones. I use them a lot also but I’ve never baked them to do it. I’ll have to try that next time for storing them longer to use later. Thanks! Thank you for your comment Jennifer! Make sure to let me know how the baking goes for you! Thank you so much for this post! I have used pinecones in the past on my wreaths because I love the organic feel. But they always came off. Now because you have posted this wonderful blog I can start using them again. Do you have any suggestions for securing plush items? I was going to thread clear fishing line through them to secure them but wasn’t sure if there was a better technique. Thank you again. Thanks for good instructions along with the pictures to illustrate your work/ideas. Always like your hints, tips, etc. Thanks again. Thank you for your comment Claudia, make sure to subscribe to my emails (above if on computer, below if on mobile) for more wreath making tips and ideas. I have some pine cones I bleached and then I added modgepodge to the tips and rolled them in colored beads and I put them in a dish a table décor! Sounds beautiful, thanks for the tip! I have done that myself. I don’t know what I am doing wrong. but my whole house stinks when I am baking them. I was just wondering do I have my heat turned up to much. My husband won’t let me bake anymore cause of the smell. Thanks so much for the help. Hmm, maybe it is the type of pine tree in your area. Mine do not smell but a faint pine smell. What do you set the heat too? I use 200 and check every 30 minutes. You could kick the hubs out for the day. Hee Hee. Just kidding. Hi Kim, my pine cones produced a smell as well, but thankfully it abated after a few hours. I baked mine at 300* for approx 2hrs and they opened up fully. Mine were completely closed when I started. I like to arrange my pine cones in large pretty bowls and sprinkle with cinnamon for the holidays. I also place them in the floor like beside couch and an entrance into a room. But pls watch out for your pets. Cinnamon can hurt dogs. Thank you for your comment Ruby! Love the real pine cone idea! Im wondering if adding a scent like cinnamon to them is possible. I also make soy candles, would it possible to use the candle scent on them? Any ideas ? In the past I’ve used the ones that have that dry crusty sap on them. I didn’t wash them but I put them in the oven. I just did it to kill germs and any creepy crawlys that might be on them. To my surprise the crusty sap turned into a beautiful and natural graze that never wore off. But I did have the oven low because it tended to smoke if too high. Hi,Julie I just picked up pine cones to put on wreaths and did not know what to do with them.Thanks for the advice.I Love reading all the comments. Thanks for the pinecone tutorial. Just another great tip from a very talented lady. You’re so sweet Cindy, thank you! Oh Julie, what a neat way to preserve pine cones and a clever idea to hang them…I think I would like to add a scent like cinnamon, could I use the liquid potpourri? Would I soak them a little bit before baking or put some liquid potpourri in a spray bottle and mist them after they have been baked? Thanks for this tutorial, Julie! Your tutorials are always very thorough and easy to follow. I’ve got tons of pine cones in all sizes, just waiting to be used. Now I’ll know what to do with them all! Awesome Miranda! So glad this helped you! 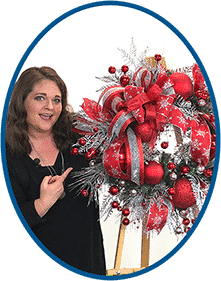 Make sure to subscribe to my email list so you will know when I post another wreath/decorating tip. No it won’t but you can try sealing them. The moisture is what makes them close. Oops! I didn’t finish before I posted my last comment! I have used pine cones in the past for center pieces. I spray paint them fun colors and spray glitter, and then put them all in a large vase or glass bowl. Depending on the colors, they can be used for every season. Hi Ms. Julie, really enjoyed this information – will letting the cones dry out in the sun have the same effect? Thank you for being so unselfish with all of your helpful hints!!!! Continue to be blessed!! Yes, they open nicely but you still may get bugs that crawl and nest in them. You could dry in the sun and then seal in a zip lock bag, AFTER they come to room temperature, for a few weeks if you want. I’ve done that too with small cones. Oh Julie, this is such a great tip for pine cones. I have used a few before and didn’t do any prep work. I am so glad to know now exactly what to do to prepare them correctly resulting in giving my customers the best in everything I make. You are a gem not only creating beautiful items to sell but also sharing fabulous tips with others. Thank you. Thank you Sharon, glad you found it useful. Thank you so much for the information that you’ve shared, the pine cone cleaning is one that I will use this fall. God bless you. Your wreath is just beautiful. Do you just do tutorials? Do you have an Etsy shop? Just saw this on Hometalk today. Thanks so much!? Hey Janice! Thank you for your kind comments. I also make and sell wreaths (www.southerncharmwreaths.etsy.com) and teach others how to make and sell wreaths too. Hi Julie ! I am brazilian and love her work, thank you. Hello Julie! I love your work. I did have a question..how do you get the stickers on the pinecones so that once my wreath is completed it can be touchable without yelping an Ouch! Any insight you could give would be great ! Thank you! Thank you for this, now I can use some of the pine cones from my sister and brother in laws cabin. They have so many pine cones. Can hardly wait. Thanks you so much for the info, I have a question I have pin cones and put some in a wreath i made but i wanted them to stay closed and little how do I do that. All mine open up. They close up when they’re wet. If you want a smaller cone shape when dry, you need to use a different variety of pine. There are several. I’ve washed, let air dry for a few days, microwaved, then a week later baked on 250 for 2 hours. I still have white on them, but never had sap. I live in Louisiana, don’t know if where I live makes a difference. I really want the white off with a natural shine. Please help. What am I doing wrong? Thank you for sharing all your advice and how-to tips. The results are worth the effort and so affordable when decorating for the holidays. Is there a way to stop the pinecones closing if they are for outdoor use and exposed to the elements? Not sure, perhaps if you tried spraying them with a sealant first. To avoid wasting time, I drill a hole in pine cone, insert hook and glue. You are going to glue anyways. Hope this timesaver works for you. Thank you for this informative, fun post! I don’t have a lot of time for trial & error with my crafts due to…well, life, I guess. Lol! This way sounds much better for affixing pinecones to things, than how I had been. Can’t wait to try it out! All the best to you! Thank you for the wonderful tips. I was wondering if the eye screw needed to be a special size or strength? i see you referenced the Hillman ones and was wondering why you chose that brand. I have some jewelry making ones that are smaller and would like to get your thoughts on using them. All the best! If you’ve had them for years, I wouldn’t bake them. Baking gets rid of the bugs and any eggs that might have been laid in them. Take a basket line it with tin foil (shiny side up). Then fill it with pine cones ( some natural, some sprayed either gold or silver), battery operated lights and potpourri . The lights will heat the potpourri. Nice on a fire place hearth.